Far too often we can get caught up in one regular-season game, especially one this early, and end up making a bigger deal out of it than it really warrants. But what about taking a matchup between two teams that, at least in the current standings, are the best in the National Hockey League, and making a big deal out of that? Fair game, you say? Let's do it. 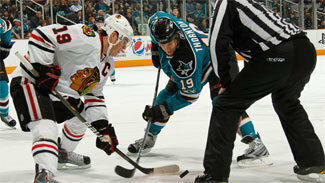 Highlighting the 10-game NHL schedule Tuesday night is the one that will start last -- Chicago Blackhawks at San Jose Sharks. Chicago (7-0-2) became the only team in the NHL without a regulation loss when the Anaheim Ducks knocked off the Sharks, 2-1, Monday night at Honda Center. San Jose is 7-1-1. 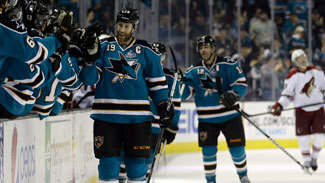 San Jose has two of the top five scorers in the NHL in Patrick Marleau (nine goals) and Joe Thornton (11 assists). Joe Pavelski (12 points) and Logan Couture (11 points) are also in the top 20. So it's not really a surprise that the Sharks have one of the best offenses in the NHL this season, averaging 3.22 goals-per-game even after scoring just one Monday in Anaheim. However, secondary scoring has been an issue for the Sharks, and it's coming back to bite them of late. Marleau and Thornton have gone cold in the last three games and the Sharks have only two goals in the last two games, just six in the last four. Chicago's offense may be slightly deeper considering the Blackhawks have had 12 different goal scorers this season to the Sharks' eight. Then again, the Blackhawks have scored just 16 goals in the last seven games since scoring 11 in their first two, but that might have to do with weary road legs. The comparison in this matchup has to factor in that the Sharks are scoring more goals per game than Chicago and have a power play that is operating at 26 percent versus Chicago's still-not-too-shabby 20.6 percent. Even without Brent Burns, the Sharks are tied with Ottawa for No. 1 in the NHL in goals-against per game (1.67). San Jose is also ranked sixth in penalty kill (87.8 percent). Brad Stuart has settled back into his old role as the Sharks' top stay-at-home defender while rookie Matt Irwin had provided quality minutes before Jason Demers returned to the lineup two games ago. Again, because Burns isn't playing right now the argument can be made that Chicago's defense corps is deeper than San Jose's. Duncan Keith, Brent Seabrook, Niklas Hjalmarsson and Johnny Oduya take up a lot of the minutes, but Nick Leddy has provided the most offense from the back end with five points. However, stats win the battle here and it's hard to argue against the fewest goals-against per game in the NHL. Sharks goalie Antti Niemi has been spectacular, with a 6-0-1 record, a 1.80 goals-against average and a .936 save percentage. Niemi limited Calgary, Vancouver and Nashville to just one goal each and gave up only two goals to both Edmonton and Anaheim. He didn't play Monday, so he'll likely be back in and fresh to face the Blackhawks. Chicago goalie Corey Crawford has been busy answering the critics that suggested he wasn't good enough to be a No. 1 goalie. Crawford is 5-0-2 with a 1.66 GAA and .934 save percentage. The backups have also been solid. In particular, Ray Emery basically stole two points for Chicago with a 45-save effort in a 3-2 shootout win over Calgary on Saturday. Thomas Greiss has allowed only two goals (both to Anaheim) in two starts. This was the area where the Blackhawks fell off last season, but so far this season their penalty kill has been almost perfect and their power play has been efficient enough to where it is not a detriment to the team. Chicago leads the NHL in PK at 94.4 percent; it has allowed only two goals in 36 total times shorthanded. Forwards Marcus Kruger and Michael Frolik have turned into effective, reliable penalty killers. The Blackhawks' power play is clicking at a 20.6-percent clip; that's middle-of-the-road in the NHL, but far better than the 15.2-percent PP the Hawks put on the ice last season. San Jose has been better on the power play (26 percent), but also has had a whopping 16 more power-play chances than Chicago in the same amount of games. The Sharks' PK, while not as good as Chicago's so far this season, is still among the best in the League at 87.8 percent. Both coaches have had strong starts to this season despite dealing with some scoring woes of late. Chicago coach Joel Quenneville has seemed to find a way to correct the special teams problems the Blackhawks encountered last season, while also smartly inserting Dave Bolland between Patrick Sharp and Patrick Kane. Sharks coach Todd McLellan has gotten a lot out of a defense corps that is depleted by injuries to Burns and Demers, and flu-like symptoms that have kept Dan Boyle on the sidelines for two games. He has also found a way to effectively work Scott Gomez into the lineup. But it's hard to ignore that Stanley Cup championship Quenneville and the Blackhawks won two and a half years ago; partly at the expense of the Sharks, thanks to a sweep in the Western Conference Finals. Chicago has earned 16 out of a possible 18 points despite playing at home only twice, and the fact that they've already played three sets of back-to-backs. The Blackhawks are 5-0-2 on the road and 3-0 in the second half of a back-to-back. The Hawks have already played five teams that made the playoffs last season, including the Stanley Cup champions (Los Angeles Kings), the runner-ups in the Western Conference (Phoenix Coyotes) and the Presidents' Trophy winners (Vancouver Canucks). They are 4-0-1 against last year's playoff teams, factoring in home wins over the St. Louis Blues and Detroit Red Wings to go with road wins over the Kings and Coyotes. San Jose has played six of its nine games at home (5-0-1) and only three games have come against teams that made the playoffs last season (Phoenix, Vancouver, Nashville). The matchup appears close to even on paper, but the Blackhawks have held up against greater challenges (seven road games, three sets of back-to-backs, season-opener against the 2012 Stanley Cup champs, five of nine games against 2012 playoff teams). They're also coming into San Jose off a win, while the Sharks suffered their first regulation defeat Monday night.